The cousin of Bruce Banner (a.k.a. The Hulk), Jennifer Walters received a blood transfusion from Banner after being gravely injured, which allowed her to transform into She-Hulk. Like her cousin, Jennifer possesses great strength, durability, endurance, and a healing factor, but she almost always retains her full intelligence. Hard to believe this is only the second She-Hulk Minimate. 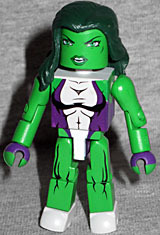 Showing how Minimate design has changed over time, this She-Hulk and the last one are both wearing the same costume, but really look very little alike. It's more than just the darker colors - the details are more intricate. The big, simple hair on the old one looks better, though. And the white paint on her torso was applied over the purple, but isn't thick enough to keep the darker color from showing through. 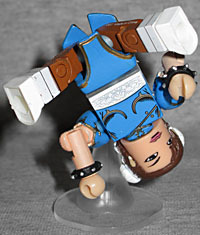 Chun-Li longs to live the life of an ordinary woman, but her strong sense of duty and obligation force her to tirelessly continue her investigation to take down the criminal organization Shadaloo. Extremely proficient in kung-fu, she is well-known for her deadly kicks, and is also able to utilize her spiritual energy in battle. 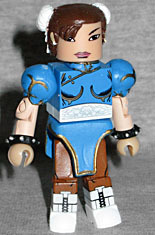 This is also the second Chun-Li, and again, this is a massive improvement. She's wearing her blue qipao and brown leggings, but the white boots have smaller details, her studded bracelets are less clunky, her sleeves now have actual poofs, and the painting on her torso is outstanding! She gets a new collar to add to the detail on her clothes, too. Her face is much better, and her hair has more sculpted details (plus the "ox horns" are the appropriate white, rather than brown). The set includes a waist flight stand, so she can do her kicking tricks, and her new skirt allows the legs to have a full range of motion. Nice work, that!